The series of 2.5”diameter is designed for economical solution as point of use to filter many applications such as beverages, coffee, wineries, ice maker and many others. The 4.5” diameter has multi-stage depth filtration integrated into their design, utilizing a technology that separate layers of micron filtration. The outer layer traps large particles that results in a lower pressure drop as compared to conventional filters. 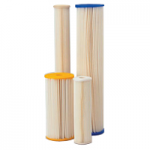 This layer of filtration provides a higher dirt holding capacity than a standard polypropylene and string wound cartridges. 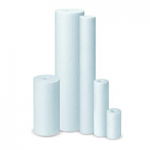 These types of filters are manufactured from a special formulation of resin- impregnated cellulose and polyester fibers. These materials provide a higher wet strength than regular cellulose cartridges. It also provides a higher wet strength, higher flow rates and dirt holding capacity, while maintaining extremely low pressure drop. The media is pleated around a polypropylene core adds strength and the ends are immersed in a thermo-setting vinyl plastisol. Reduce or eliminate bad taste, odor, chlorine and many organic contaminants. 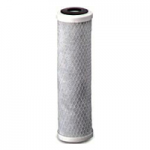 Multi Media Filter also known as depth filters the layers of filtering media removes or reduce the suspended particles, turbidity such as clay, mud and act as a pre-filtration for oxidized iron. The entire bed acts as a filter, rather than only the top few inches. Turbidity is trapped throughout the bed, enabling the filter to hold far more solids filtered from the water before backwashing is necessary. It can remove large particles down to 5-15 microns in size. 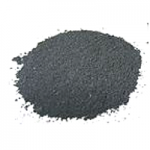 Anthracite is a bituminous coal that reduces and screens particles to its proper size for best filtration capabilities. Sand: The sand provides the necessary support for the upper layer and assist in the hydraulic involve during the backwash cycle. Garnet: The garnet media is a naturally hard, durable high specific gravity mineral. Its resistance to attrition means less loss of media and shut-down time. High specific gravity lends more control during backwash and lower losses to drain. The angular shape provides more ability to filter and longer production runs. Another important advantage is that the multi-media filter can clarify water at a much higher flow rate than a sand filter. 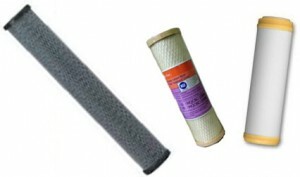 Granular Activated Carbon Filter has a larger particle size. It has a high density balanced pore structure for more efficient absorption. 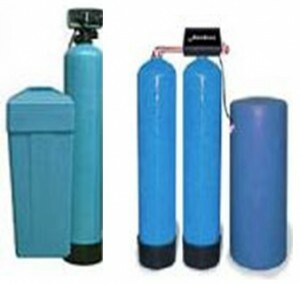 The common application of carbon filtration is use to improve the objectionable taste, odor and color, removes chlorine, volatile organic chemicals and tannin. However other chemicals like sodium or nitrate will not be removed by carbon. The ability of the activated carbon to remove chemicals will be used up, periodic backwashing to eliminate accumulated suspended matter and to re-grade the filter bed is needed. It is very important that the type and concentration of contaminants, and water use, be known in order to determine the correct size of system. 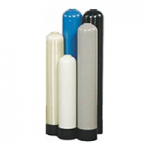 Activated Carbon may be used in either domestic or industrial applications using pressurized filter vessels. Water Hardness is cause by excessive minerals like calcium and magnesium ions present as sulfates, chlorides, carbonates and bicarbonates. These hard ions causes’ undesirable effects, it interferes with almost every cleaning task from laundering and dishwashing to bathing and personal grooming. Clothes washed in hard water may look dingy and feel harsh and scratchy. Dishes and glasses may be spotted when dry. Hard water may also cause a film on glass shower doors, shower walls and bathtubs. Hair washed in hard water may feel sticky and look dull. Hard water also affects the performance of some equipment like water heaters or boilers that accumulate scale build-up from hard water insulates the water from the heat source. You can reduce water hardness by using a water softening tank installed to your water supply line. Most of the water softening equipment in the market operates on the ion exchange principle to remove hardness minerals from water. The ion exchange process takes place as the hard water passes through the resin media. The hardness ions will attach themselves to the resin beads while the sodium in the resin beads is released simultaneously into the water. This ion exchange process occurs numerous times while in service. Eventually, the resin beads will collect so much hardness that it will become exhausted and requires recharging through the use of brine solution to replace the sodium and enable the ion exchange process to continue. Softer feeling on your skin and more vibrant hair. Longer use of appliances like washing machines, dishwasher and water heaters.